Yeti, tough enough to transport tofu and kale. Update to this story. Not tough enough to continue supporting NRA Foundation that helped kids and youth education. On April 21 Breitbart News reported on a NRA-ILA statement which said Yeti Coolers had cut ties with the NRA Foundation. 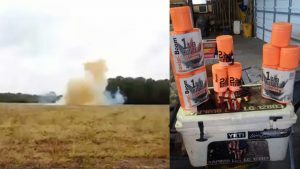 Atkinson’s called out, “Hashtag Yeti, Hashtag NRA, Hashtag AR-15,” then had his friend take the Yeti out in a middle of field and set down the cooler. Atkinson hit it with the second shot and the explosion was huge.